“Colin is now 4 1/2 years old, and has been seeing Dr. Nicole Lackner for Peoria chiropractic care for quite some time. I originally consulted with Dr. Nicole, not for Colin, but for our 12 year old, non-verbally autistic son. The CEO of our local Easter Seals-UCP facility had recommended Dr. Nicole to our family for our son Kyle, as he has struggled with many biomedical and neurological issues associated with his autism. “While at an appointment for Kyle, I spoke with Dr. Nicole about Colin, his drooling and delayed development in the area of speech. Colin, at 18 months, was going through many bibs in a day. I couldn’t keep his clothes dry under his chin. She explained to me that a caesarean section delivery, which Colin had, was difficult on children and that Colin most likely had a subluxation that could be fixed with an adjustment. “It was hard enough for me to believe that a chiropractor did adjustments on 12 year olds, let alone 18 month olds. I was skeptical and a little concerned, but I had come to trust Dr. Nicole as I had become more educated about the necessity for chiropractic care. Now, if I were to have another child, I would have them adjusted right after birth, and keep them on a maintenance schedule. “Dr. Nicole adjusted Colin only 2 times and ALL the drooling stopped – NO MORE BIBS. We kept Colin on a recommended chiropractic schedule. My husband I believe Dr. Nicole’s chiropractic adjustments, halting his immunizations, receiving 30 minutes of speech therapy, and attending a developmental preschool two mornings a week, allowed Colin to develop typical speech right on schedule. He has been attending a typical preschool since he has been three, and is now always talking. “Just recently I was taking Kayla, our 14 year old, for an adjustment, and Colin was along for the ride. He kept repeating for the 20 minute drive that his ear hurt. Colin never has complained about pain. I knew I should probably take him to the pediatrician after getting Kayla adjusted. While Kayla was getting an adjustment I talked with Dr. Nicole about Colin’s ear. Even though he wasn’t scheduled, she checked and adjusted Colin and opened up his ear tubes. He was better by that night, and I never did take him to the pediatrician or give him any over-the-counter medicine. “One time when Kyle was home his right ear was turning red, it was hot, and Kyle kept putting his finger in his ear. I was concerned that he may have an infection, but it would have been difficult to get him to a doctor. Since we were going to see Dr. Nicole and she had previously helped Colin with his ear, I asked her to check and adjust Kyle. This was especially helpful since Kyle is unable to communicate verbally where he is hurting. She adjusted Kyle and opened up his ear tubes. Within a couple hours they weren’t red, or hot, and he wasn’t putting his fingers in his ears. “Dr. Nicole is very patient and caring. She is also selfless. Due to lack of acceptable services in the state of Illinois and especially in Peoria for children with autism, we have had to put our son in a full time school and residential placement in Springfield, Illinois. This is 1-1/2 hours away from us, and we bring our 12-year-old son, Kyle, home every other weekend. Many times Dr. Nicole comes in on her day off when we have Kyle home to adjust him, and usually the four of us also. 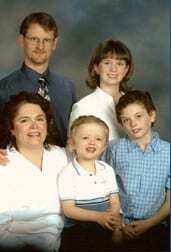 “Even our autistic son Kyle knows the importance of chiropractic. When we get to Dr. Nicole’s office, he runs to the office door, and if possible, he would make a beeline to her office, and then the adjusting chair, but he has to wait his turn. Dr. Nicole’s staff knows Kyle and his peculiarities, and we always feel at home there. When it is Kyle’s turn, he hops from the chair, to one adjusting table, and then to the adjusting bench. His favorite adjustment though is when she adjusts his feet. At 12 years old Kyle has no arch/flat feet, the beginning stages of bunions, and both feet flare outward when Kyle lies down and walks. “When we first saw Dr. Nicole regarding Kyle, he struggled with constipation. There were a number of times that after an adjustment, he had a bowel movement pretty quickly. Kyle, in his own way, speaks to Dr. Nicole regarding his own particular chiropractic needs. He has taken Dr. Nicole’s hand a number of times while she was scoping him, and put it on a section of his upper neck to insinuate that he needed adjusted there. The scope then showed that indeed he did have higher readings in that area. “I have recommended Dr. Nicole at Inner Spirit Chiropractic, to all to whom I have had the opportunity. My husband and I a few days ago recommended Inner Spirit Chiropractic to some friends of ours whose daughter has been struggling with headaches every day. They have tried all the “traditional” medical protocols to no avail. I hope they go to see Dr. Nicole, because I KNOW she will be able to help this young girl. “Chiropractic makes sense. Un- kink the hose and let the body do what God intended it to do on its own. We are thankful for Dr. Nicole and her special brand of Peoria chiropractic care!